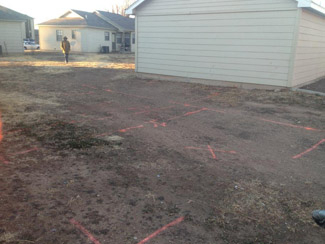 Ground Penetrating Radar Systems of Texas was contacted by an environmental firm to mark out any underground utilities or obstructions within the proposed boring locations in Amarillo, TX. Wade Vickers of GPRS Texas mobilized to the site and gave a precise location of the electric, communications, gas and water lines within a 20’ x 20’ area of each estimated boring location. Since GPR shows data in real time, the results were marked directly onto the surface using marking paint to give the customer and workers knowledge of the utilities location beneath the surface. After the GPRS process was complete, multiple locations were adjusted to avoid any underground conflicts. This saved the firm and drillers costly setbacks, and possible injuries. GPRS reduces risk and cost, promotes a safe work environment, and provides non-destructive testing by locating materials such as concrete, plastic, metal, steel, and pavement. For private utility locating in Texas: Amarillo, Bishop Hills, Pampa, Borger, Masterson, Hereford, Plainview, Canyon, and Dumas, call (806) 336-2337 or email wade.vickers@gp-radar.com.